Some of you may be familiar with our classic Making Memories Tag Maker. Fortunately, thanks to the Slice, you no longer have to worry about punching out your tags by hand. First, pick a tag shape from the Tag Maker card and cut it out with your Slice Cordless Design Cutter. Next, use the Slice Tag Maker to put a rim around your shape. 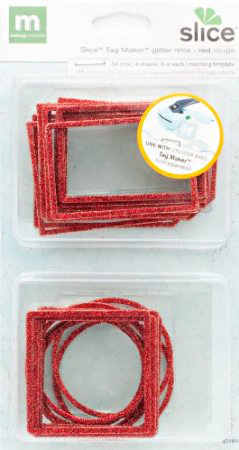 Each tag shape cuts in three sizes to correspond with Making Memories Tag Maker rims.